Congratulations to the teachers who received Project Community mini-grants in 2017! Project Community is Northwest Community Credit Union’s mini-grant program for teachers. In the three years that it’s been running, Project Community has given $164,000 to 187 local educators. This year, we awarded over $58,000 to 64 teachers at 54 schools around Oregon. Centennial Elementary School. Michelle LeFeber is purchasing a reading program and award-winning children's literature to teach comprehension, vocabulary, and grammar. Liberty Elementary School. Joy Huddleston is using her grant to help teach skills like patience, kindness, and forgiveness using picture books. Memorial Middle School. Lorinda Duncanson will be buying art supplies which will be used to promote self-discovery and self-regulation for students with Autism. Oak Elementary School. Leanna Bennett's grant will be put towards reading intervention games which will help engage students in developing reading skills. West Albany High School. Cole Pouliot is purchasing scientific calculators which will support the learning of formulas such as monthly payments, compound interest, and more! West Albany High School. Morgan Wadlow will use her Project Community funding to purchase books that will help students prepare for their first job. Bend High School. Jeannie Fraley is using her grant to invest in safe cookware to teach life skills students how to prepare fresh food. Bend International School. Vidal Cid will be buying 3D printers so students can design, develop, and see their projects come to life. Redmond High School. Dan Kernion is using his grant to purchase materials students can use on Tech Program projects which earn them college credit while still in high school. Redmond High School. Dawn Lillis is investing in Lean Factor Flow Kits which she uses to teach students about the business philosophy of lean manufacturing. Vern Patrick Elementary School. Jodi Husband will be purchasing new headphones for her school so that students have access to online lessons and can engage with them without distractions. Ridgeview High School. Nathan Gosselin-Sebens was granted funds to purchase an Apple iPad Pro and Apple TV which will allow him to move about his choir class and engage with students as he teaches. Creslane Elementary School. Brandee Buehler will be updating her classroom's library with new books to keep students excited about reading. Creslane Elementary School. Chemen Clearwaters will be purchasing traditional books and books on CD for a wider variety of materials that will help create life-long interest in reading. Creswell High School. Sandi Green is using her grant to purchase new Theory books to enhance her music curriculum class. Latham Elementary School. Peter Bowers is purchasing "Reading Counts!" licenses for a motivational reading program for all students in their school. Yoncalla Elementary School. Chris Cherry will be engaging students in science with new magnifiers and magnetic wands. Cesar Chavez Elementary School. Steven Korin will use his grant to purchase Learning Literacy Intervention books to ensure students struggling to read have books that are available at their reading level. Danebo Elementary School. Kate Brady is using her funds to purchase software and technology to assist with building foundational literacy skills to create independent reading success. Elmira Elementary School. 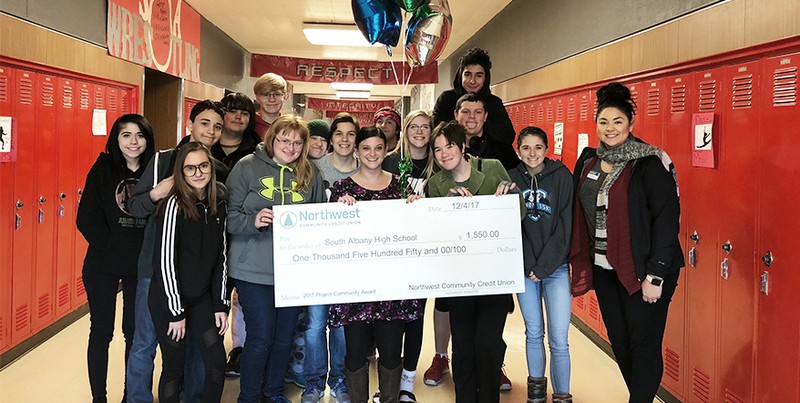 Billie Perreir is using her grant to buy Chromebooks which will allow students to work and learn independently while she teaches small groups at a time. Eugene Christian School. Katrina Callahan will use her Project Community award to purchase STEM kits to give her kindergarten students a head start on engineering sciences. Fairfield Elementary School. Stacie Wicks received Boomwhackers, handbells, and alphadots to help her elementary kids about music, rhythm, and melodies. Irving Elementary School. Jacquelyn Bratland will be purchasing an educational Lego table to encourage free exploration with her Kindergarten classes. North Eugene High School. Golda LoBello is using her funding to expand her classroom library with new genres and reading levels. Willagillespie Elementary School. Jannine Johnson is using her grant to purchase books which will be added to her library about Growth Mindset and social/emotional health. Willagillespie Elementary School. Audrey Hartsfield is expanding her classroom library with quality, age-appropriate books that can be readily available for all of her students. Willamette High School. Dain Nelson will build an augmented reality sandbox that teaches his students about geographic concepts. Churchill High School. Judy Kerner is investing in headphones for students who struggle with reading fluence and comprehension. Spring Creek Elementary School. Dawn Henderson is buying Breakout EDU kits which are a unique collection of items used to play games involving critical thinking, solving puzzles, collaboration, and more. Fleming Middle School. David Shindelman will use his Project Community funding to transition current science curriculum to a more hands-on, STEM-based program, using digital scales, molecule modelling kits, etc. Grants Pass High School. David Brannen’s funding helped start a brand-new guitar-building class. North Middle School. Bob Bath is using his award to update software and equipment for recently-purchased Chromebooks. North Middle School. Nealy Wheeler will purchase Chromebooks to teach her special needs students life skills. South Middle School. Breanna Holtz is building up her classroom library. South Middle School. Casey Petty will buy Breakout EDU kids to teach his students about life skills like teamwork and perseverance. Kids Unlimited of Oregon. Jane McAlvage will purchase microscopes for underserved students to expose them to life science studies. Washington Elementary School. Zoryn Thompson will buy shoulder rests for violins, which will help beginning students get comfortable with the instruments. Table Rock Elementary School. Rachel Bluth will use her Project Community award to take the school’s third grade classes to the North Medford High School Planetarium. Hillcrest Elementary School. Sharon Rogers will purchase child-appropriate drums for the music program. North Bend High School. Michael Campbell will use his Project Community award to purchase a classroom set of Spanish English dictionaries. North Bend High School. Christina Geierman will buy carbon dioxide sensors for his dual-credit biology course. North Bend Middle School. John Grief’s funding will purchase video-editing software for his students’ video projects. North Bay Elementary. Dana Cahill will use her Project Community award for a range of art supplies. Candy Lane Elementary School. Sarah Black’s grant will purchase a color printing and instructional books for her English language students. Jennings Lodge Elementary School. Kristan Beckwith will use her Project Community grant to purchase supplies for science experiments for kindergarten, first, and second grades. Ogden Middle School. Daniel Rogers’ funding will purchase programmable robots that provide hands-on coding instruction. Cleveland High School. Esther Vieira will purchase an iPad to capture her students’ stories to improve their Spanish. Cleveland High School. Ian Maurer’s Project Community award will purchase Chromebooks for a technology-focused algebra class. Lewis Elementary School. Mark Richner will expand his classroom library with diverse books and audiobooks. Eastwood Elementary School. Emily Pettibone’s Project Community funding will purchase a classroom set of interactive clocks to help her students tell time. Fullerton IV Elementary School. Gretchen Lake will purchase new physical education equipment for her PE students. Fullerton IV Elementary School. Chris Lofton’s grant will purchase supplies and curriculum for escape room workshops to help his class solve puzzles and work together. John C. Fremont Middle School. Teresa Martin will use her funding to purchase books for a creative writing project. Lincoln Middle School. Nick Krissie’s Project Community award will purchase CAD software and a 3D printer. Melrose Elementary School. Kate Royce will buy sets of chapter books for her third grade readers. Oakland High School. Daniel Endicott’s grant will purchase graphing calculators for his high school students. Roseburg High School. Jennifer Weiss will purchase a classroom set of Ray Bradbury books. Winchester Elementary School. Ashley Marshall’s funding will provide guided reading group book sets for her first graders to practice reading. Elizabeth Page Elementary School. Staci Hagel will purchase Chromebooks for the Gifted & Talented program. Guy Lee Elementary School. Shelby Masterson’s Project Community funding will purchase an interactive whiteboard. Hamlin Middle School. Kathleen Weaver’s award will purchase a classroom set of atlases to teach her students about current geography. Mt. Vernon Elementary School. Heather Dillon will use her grant to purchase math manipulative kits. Springfield High School. David Frost will purchase headphone and microphone sets for Chromebooks.